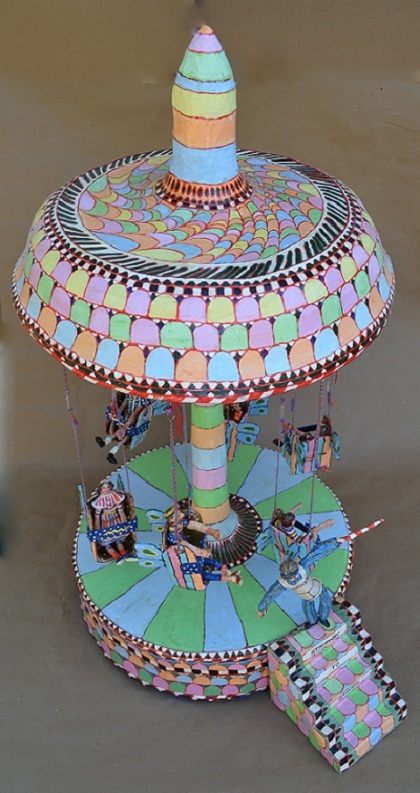 My Carnival rides are made of paper mache, cardboard, pencils, string, wire, paint, and foil. The figures are made of sculpey clay, an oven fired clay. Everything is varnished and painted. My large amusement park rides are $900. My ride with the swings, resembling a ride called the "Yo-yo", is called the "stairway to Heaven" This is because life to me is kind of like a carnival ride, full of lessons learned, and we are given time so that we can experience things in a sequence. I guess if we don't learn anything we have to do it over and over until we get it right.